As a tiny island in the middle of the Mediterranean and as the smaller island of the Maltese archipelago, Gozo sometimes is simply seen as an extension of mainland Malta. As a tiny island in the middle of the Mediterranean and as the smaller island of the Maltese archipelago, Gozo sometimes is simply seen as an extension of mainland Malta. However, Gozo is a tourist destination in its own right. The island with an area of 67km2 has its own identity and unique characteristics. Although it is dependent on mainland Malta for a connection with the rest of the world (Gozo has no airport facilities), visitors to the island and travellers who spent their holidays here are often smitten by the scenery, the adventure and the experience ….. and many say they will return again. To Gozo, one has to add the even smaller island of Comino, which is a thriving hub of water sports in the summer season and for the rest of the year it is a true paradise of pristine countryside. The Malta Travel Authority promotes the islands of Gozo and Comino together as a distinct destination from Malta itself. This means that when it comes to digital exposition, promotion of the islands needs to have its own digital channels on social media that represent and portray them as unique holiday destination across the seasons. VisitGozo.com is the portal which is operated by The Tourism and Economic Development Directorate in Gozo to promote the island of Gozo as a separate destination from the main island of Malta. All the work on VisitGozo.com is done within a framework where the click ecosystem is made up of an extensive mobile responsive and search engine optimised portal that is supplemented by various social media presences and also by Email Marketing. The strategic objective of the work that was entrusted to Keen involved creating a more appealing and user-friendly website and generating more traffic to the website. The latter focused on Search Engines as a primary source of generating more traffic. Another important facet of the work is the active presence on the different social media platforms. As a destination portal, there are no sales or bookings occurring on the website per se, so ultimately the portal’s aims is to sustain the audience through the customer journey from the point that someone becomes aware of the island as a destination, and spark enough interest until the person is in a position to book a holiday in Gozo and plans the trip. The website covers the island highlights and attractions along with detailed listings of suppliers and organisations that provide hospitality and associated services in Gozo. Providing the portal in multiple languages is fundamental for tapping into the respective foreign markets. Ultimately the digital channels have to congregate to help the customers (including both the traditional and the spontaneous travel customer) in the customer journey as they find their inspiration, make a booking, visit the island and share their experience. Statistics clearly show that traditional travellers conduct a lot of their research related to holiday planning online. We also know that before deciding to book a holiday, one needs to have a yearning to visit a particular destination. This desire can be sparked by many different things but online this can range from a blog post by influencer, to the holiday snapshots of a friend on Facebook or Instagram, or a captivating video posted on social media and in this latter aspect one can pin the spontaneous traveller who acts on the spur of the moment and makes a quick decision. On the other hand, sometimes the desire to visit a particular county is built over time, thus once the holiday planner is aware of the destination, one needs to sustain that interest until he or she is compelled to take action and make a booking! In the case of VisitGozo, Keen was aware that we were dealing with a broad audience. The social media platforms need to promote the island of Gozo and Comino to a worldwide audience. However, when one looks deeper, one needs to address different bands or segments that need to be understood. Amongst some of the most prominent one notes the local or domestic market (that is the Maltese residents visiting their ‘sister’ island for quick escapes), the European market and travellers from the rest of the world. Not all visitors have the same interest and thus one can also segment not only by country of origin or language spoken but also according to activities that people seek to indulge in whilst on holiday. The tourist that travels for diving experience is different from the one that comes to the island to attend the opera. Similarly, travellers that come with their young children have different needs than young people in their twenties travelling for pure adventure. The age, status and affluence of the traveller will also impact on the decisions of choice and this phenomenon all needed to be considered. The main source of traffic in terms of Social Media platform. Looking at the Analytics one can also clearly see which are the Social Media platforms that one should focus on. While Google Analytics is one face of the coin, there is no doubt that looking at the Analytics on each Social Media platform is an important part of the first audit of the said channel. 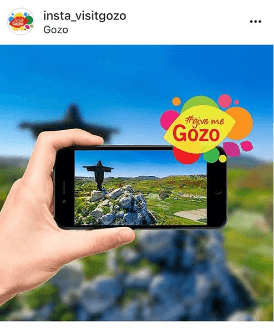 Because of Gozo’s small size, it’s difficult to say which is Gozo’s closest competitor on social media but suffice to say that we have looked at different destinations both within and outside the Mediterranean basin, in Europe and beyond to have a more complete picture of how other destinations were distinguishing themselves and building an engaging brand on Social Media. The key resource in Social Media is content (along with time!). Being relevant and fresh in terms of posts, starts out by being acutely aware of what content is already available. A ‘Gap Identification’ exercise revealed some particular content aspects that needed to be addressed in order to ensure that the right type of content was available to target different types of holiday makers and travellers. This was also very important in order to chart out a content calendar that spans out a year. Armed with all the above it was time to formulate the actual strategy and tactics. The strategy defined the main platforms and ensured that for each platform used, the right sort of tools, mechanism and measurements were being managed on a daily or weekly basis. 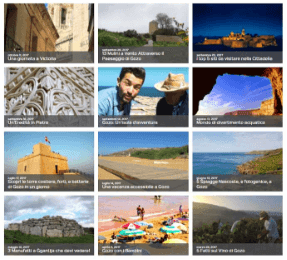 Keen adopted a strategic plan that focused on roping in actions related to search engines, keeping the portal fresh with new content via blog posts and reaching previous visitors with e-newsletter highlight events and activities happening in Gozo and Comino. The other aspect involved being very active and highly visible on Social Media. The team at Keen kept the website and all social media presences updated, monitored the activity on these channels and also tracked campaigns. 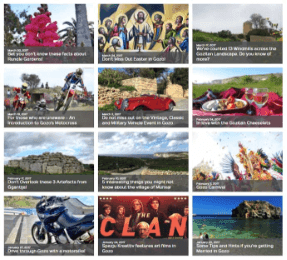 Social media work on VisitGozo.com ranged from full content calendar planning, sourcing and creation of actual content, publishing and analytical reporting on all social media platforms. If we ever needed the confirmation of the statement: – ‘a picture is worth a thousand words’, this was the project that proved it. From the first week, it became immediately clear that the engagement was about the perfect picture, a brilliant composition, a pic that captured the essence of everyday life, a unique shot, or a captivating moment – colour, emotions and adventure that had been captured on camera either as a picture or better still on video! The Content Calendar included blog posts in two languages – namely English and Italian. The blog posts were an exercise that involved researching specific topics that might be targeting certain segments and presenting an appealing story made up of both text and photos. Whilst the photos are the main attraction, the text was also written with the search engine in mind. The topics or themes of the blog posts revolved around the season, curious facts about the island, events, and ideas of things to do while on the island of Gozo. By the end of the year over 50 blog posts were posted in English and 12 other blogs posts were posted in Italian. Managing a destination’s calendar is no easy task unless you are prepared to be dedicated. This is more so, when it is Gozo, an island so small in size but that boasts so many attractions, cultural facets, and is geared to handle even the most of adventurous and demanding travellers! Target markets, segments and seasonal aspects of the island needed to be portrayed online with the aim of bringing in the maximum level of engagement (in the forms of likes, shares, comments and private messages). The content calendar followed the seasons and highlighted the string of cultural events on the island whilst exalting the bigger events like Carnival, Easter and Christmas holidays. 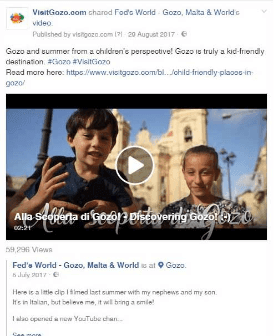 Whilst Facebook can be considered as the main social media platform, VisitGozo also had an online presence on Twitter and Instagram that were still in their early stages. Other new platforms like LinkedIn and Pinterest were on the cards in order to expand the reach. One particular phenomenon to keep in mind was that on specific channels one might have congregations of particular segments (both in terms of age, country of origin and other demographics) and thus content needed to be adapted in a particular way before posting it. The platforms were monitored on a daily, weekly and monthly basis as this helps to identify trends in real-time and adapt the posts or rope in particular tactics as need be according to the pattern at hand. As the leading social media platform, Facebook was given the importance it deserves. The work included daily posts on Facebook that covered different facets of the island – covering themes such as the natural appeal of landscapes and seascapes, historical places, architecture, different activities such as diving, bouldering, hiking, water sports, and others, tours and accommodation. Every post had to have at least one photo or link to photo or video. On this platform, posts from third party sites such as travel blogs were also posted. Uploading videos natively to Facebook was crucial to ensure that the video reaches further. Another important aspect was the sharing of posts from third parties such as distinguished photographers or travel influencers who cover the island. 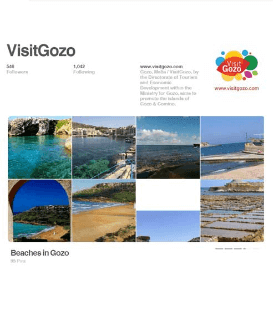 The posts aimed to solicit more engagement, more followers and more visits to the actual portal www.visitgozo.com. Over time, it was clear that posts with videos or suggestive scenery was the most engaging content. Posts on Twitter were a mix of automatic post of the Facebook Posts and retweets. 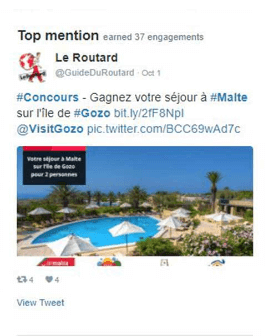 Retweets were chosen with good judgment to ensure that content that was being retweeted was in line with the message that VisitGozo aims to spread about the island as a destination. This helped ensure that the retweets were echoing the authentic voice of the brand and in no way were they diluting the core message. The number of retweets was dependent about what fresh content was being posted about Gozo and Comino by third parties and during the course of a year one could notice periods where the number of posts was higher than other periods of time. Tweets of real-time photos or videos from events often resulted in top tweets and confirming the faster pace that is typical of Twitter. The aim on this platform was both engagement and acquiring more followers. There can be no posts on Instagram without the associated #hashtags. Keen conducted regular exercises in order to identify the highest performing hashtags. Different sets of hashtags were being used at the same time. While there is no doubt that on Instagram, it’s all about how original and striking the picture is, it was noted that posts accompanied by highly interesting textual descriptions elicited more comments. Posts were done on a daily basis and at the optimum time to ensure the highest level of engagement. Whenever possible replying to comments was also done in real-time. Keen also posted a number of videos over the year on this platform. Regular analysis of the most successful posts yielded insight about what are the topics that solicit the highest engagement by Instagram users. During the year, Keen launched and started the building of the Pinterest platform for VsitGozo. This was needed in order to keep up with the fact that Pinterest had become an important Social Media platform. Upon launching of the presence, VisitGozo had 8 boards on Pinterest and during the course of a year, we continued building the boards by pinning both from the VisitGozo.com portal and from third parties. Keen focused on creating a series of interesting boards to visually depict at a glance the different aspects that make a Gozitan holiday so appealing. Whilst we were building the presence and posting more content, we kept any eye on the bigger segments that the presence attracted on this platform, the boards with top impressions, and boards with most shared pins. By the end of the project, the Pinterest presence had 38 boards and over a 1000 pins. Overall engagement in all the main platforms shot up. Facebook not only grew in terms of followers but also posts enjoyed a higher reach and engagements. Success on Twitter was not only in terms of the number of followers, but also in the number of profile visits, the number of tweets impressions and the number of mentions. Ramping up the activity on the platform yielded results and comparing activity at the beginning of the year to the end of year, shows that substantial progress had been made and the platform is slowly but surely leaving its infancy stage for a more exciting and engaging time. The sustained daily activity of posts on Instagram also brought in results. More engagement, impressions and reach were clear month after month and in fact by the end of the year, there was over 290% increase in followers. The traffic on the portal in terms of number of sessions from the different countries has increased. The surge in traffic can be seen both in mobile, tablet and desktop. Overall the level of engagement on Social Media has gone up and the portal itself has had over 20% increase in sessions.